By the 1990s, researchers realized that graphs of environmental impact didn’t produce a simple upward-sloping line as countries got richer. The line more often rose, flattened out and then reversed so that it sloped downward, forming the shape of a dome or an inverted U — what’s called a Kuznets curve. In dozens of studies, researchers identified Kuznets curves for a variety of environmental problems. There are exceptions to the trend, especially in countries with inept governments and poor systems of property rights, but in general, richer is eventually greener. As incomes go up, people often focus first on cleaning up their drinking water, and then later on air pollutants like sulfur dioxide. 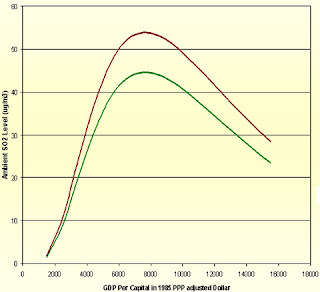 This chart shows an interesting phenomenon that offers an explanation for the Kuznets curve. The green curve (countries with strong protections for property rights) peaks at a lower level that the red curve (countries with weaker protections). As “propertyness” expands—and private property is the most incentive enriched form—individuals have a greater incentive to manage, to conserve, and to accumulate wealth that can be traded or passed on to future generations. Under such circumstances, what might be viewed as a waste stream affecting the commons, or no-man’s-land, is seen as an invasion of property. Those who impose uninvited costs are held accountable. As societies become more prosperous, the accumulation of private goods prompts the expansion of public goods. The benefits of a larger home cannot be fully appreciated in the absence of clean air and clean potable water. Those able to invest in owning a home want to know that the neighborhood is environmentally safe. Merely plugging in values for environment vs wealth doesn't offer much information about how much more or less of the effect may be due to the movement of dirty manufacturing away from the prosperous as opposed to successful, ethical environmental stewardship as a cause of the latter reverse. Is the upswing in the curve therefore sort of a "necessary evil" and an inherent part of the industrialization curve or not?